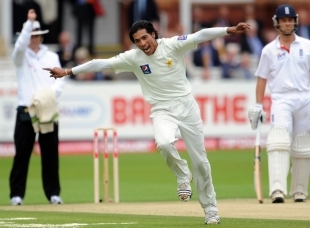 Pakistan's kit suppliers, BoomBoom, have suspended their relationship with Mohammad Amir and could also choose to sever ties with the team entirely in the wake of the matchfixing allegations that surfaced in the News of the World last week. BoomBoom are less than halfway through a two-year deal as the official kit supplier to Pakistan cricket, while Amir is one of the highest-profile members of the squad to hold an individual deal. However, a statement from the managing director of the company put the relationship in jeopardy. "Like everyone else in the cricket world, we are truly saddened and shocked by these allegations," said the managing director, Ali Ehsan. "I sincerely hope they are not true. However, we are huge cricket lovers: pure and simple. We believe in, and encourage players to have, the freedom to play, fairly." The company were keen to stress that their decision was not intended as a prejudicial judgment on the guilt, or otherwise, of Amir, whose image has yet to be removed from the company website, where he appears alongside one-day captain Shahid Afridi, Fawad Alam and Abdul Razzaq. "We cannot allow our brand to be associated with any whiff of corruption or suspicion of foul play. While the suspension of our commercial involvement with Mohammad Amir is not a step we take lightly, we nevertheless feel that it is the right thing to do while a judicial process unfolds and innocence or guilt is established. "BoomBoom is also reviewing its position as official kit supplier to the Pakistan Cricket Board."